WANT TO BE A CHEF DEB FREQUENT DINER? Continuing Education should never be out of reach, so Deb is pleased to announced the Frequent Diner Club, an affordable way to get the training you need and want. The Lighter Fare: choose six webinars of your choice at $175 – That’s six webinars for only $29 each saving you $64.70 vs the Pay As You Go option. Or you can stay on the Pay As You Go option for future webinars at 39.95 each. Allow VO chef Deb to take you through a culinary of options in the world of Pay 2 Play. Then work with her hands on as she takes each of you through the Pay 2 Play audition process. Explore different techniques that will change your read and your booking ratio! What you hear vs what THEY hear and more! It’s time to really take your vocal instrument for a test drive. Using a script of your choice, work with VO Chef Deb hands on – as she takes you on an elevator ride of characters and sounds that could change your delivery and take you to another level. Great for ALL genres – not just character work! Can’t make any money without one, but are you really ready? Allow VO Chef Deb to direct your current live read! This is an incredible opportunity to be told realistically where you are in your career and offer you constructive advice as to where to take it next. Got a demo? It’s time to let VO Chef Deb do some Dissecting!! Warning: She is one tough critic! It’s time to take your current demo for a test drive. See if your demo passes the test, or if it’s time to go back to the drawing board? Perhaps you need to know which demo to pursue next? Small upgrade but not sure what to add? 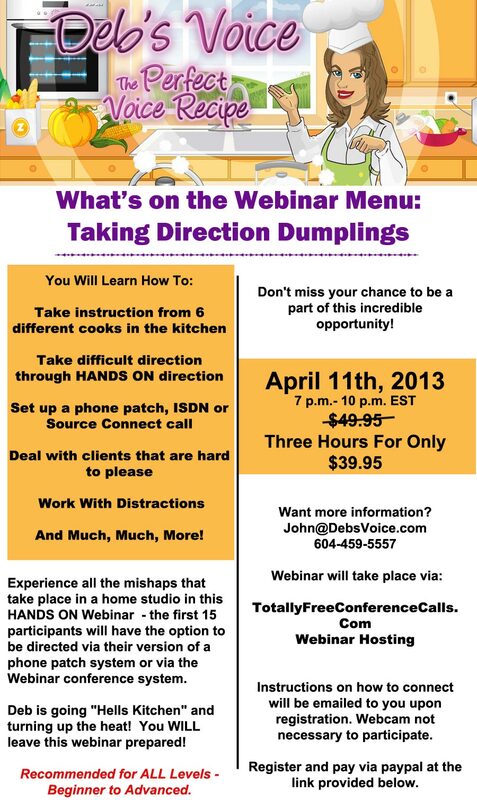 VO Chef Deb will help you dissect your demo to ensure you have a demo that will get you work! It’s important to truly understand what a good demo or what a bad demo sounds like. Will your demo make the Christmas Blooper Party or will it land you in the agents door? Find out how!! VO Chef Deb knows first hand the positive and negative of this industry and isn’t afraid to share it all! Not only will you learn as you hear each participant read in different genre’s, Deb will give you the in’s and out’s that will set you in all the right directions to either pursue this industry or advance your skills, or to RUN and turn the other direction. NOT EVERYONE IS CUT OUT FOR AUDIOBOOKS. Discover where you fit! Not meant for the shy!!! OR it might be just what you need to get yourself out of your own way and create characters that decision makers will remember. Taking the ordinary and turning it into extraordinary. Work on your favourite halloween character as VO Chef Deb takes your character to an entirely different level. Discover how to do this with all your characters. The Gender war is on – It’s a script competition you don’t want to miss! This one may change they way you do business. Just because you have a business degree, doesn’t mean you understand human nature. There are many ways to create a business and lets face it, we are a bunch of chipmunks, guys next door, witches, storytelllers and more – there is nothing PROFESSIONAL about what we do – so find out the RIGHT way to sell yourself. Create a REALISTIC plan that suits your business drive and your REAL personality. After all – you are selling – YOU! Well there you have it! It’s time to order up!